FlossieBlossoms: Simple project, big payoff! 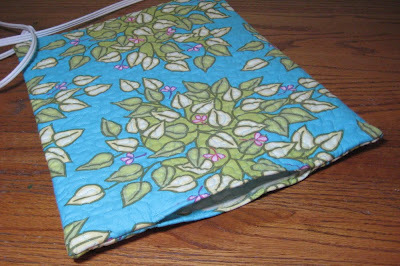 I saw a tutorial on Sew, Mama, Sew last week by TeresaDownUnder at Patchwork and other sewing projects that struck a chord with me, it was for a hot-water bottle cover. I don't own a hot water bottle and don't really want one, as I don't think it would stay hot long enough to do the job for me, as I'm so cold-blooded. (Which is not to be confused with blood-thirsty! 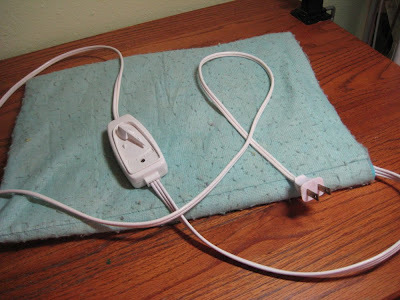 lol) but, I do use a heating pad quite often to warm me up when I first go to bed. ...and a big enough opening for the heating pad to be rolled up slightly and stuffed through on the other end. By keeping the opening small, it prevents the pad from slipping out of the cozy. To make this, I layered a piece of Warm and Natural between 2 nice cotton fabrics and did a free-motion stipple all over. Then I just folded it RST, marked where the openings would be, turned under those areas and stitched them down, and then I stitched the rest of the seams on all 3 sides. Before I turned it right side out, I did a multiple zigzag stitch on the seams to overlock them. (I didn't feel like dragging out the serger for this little project.) 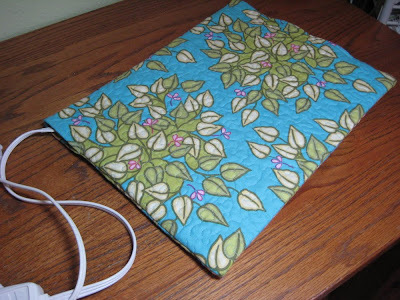 Then turned, put the cord through the big opening, out the little opening and rolled and stuffed the pad into the cozy. Voila! I think this took about an hour from start to finish and I just love it! It's so much prettier than the old cover and it feels good under my neck/back/kidney area. And it's washable, of course. 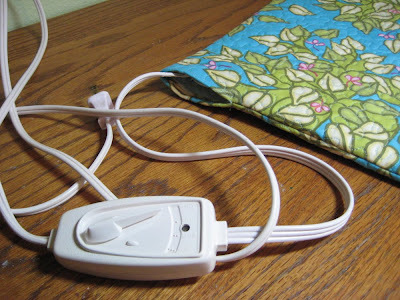 Thanks to Teresa for her tutorial for the hot water bottle that gave me the push to do this for the heating pad! Oh, and since I can't blog without a photo of the little "white weasel" as her Daddy calls her, here she is reading me out for not letting her go outside, when it's dark out. 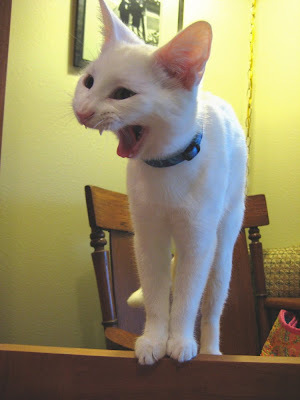 My, what sharp teeth you have, Nosey Parker! That was a good idea Floss....that makes all that lovely heat radiating through your body that much more wonderful! :) And like you said, washable is a good thing! Hey Susan, Love the heatpads new cover. Great adaption of the hot water bottle cover. I think I'm a cold blooded person too. I hate to be cold and get cold more easily that my DH. At the beginning of this winter we got a hot tub put in down the back of our garden and we often have a soak in it before we go to bed. It really warms you up right down to your bones. That's a great cover. Great fabric too! What a great idea! It sure takes it from looking "medicinal" to looking totally cute. I'm pretty sure your friend must have had you verbally agree to a disclaimer that she was in no way responsible if you fell asleep and got cooked by said heating pad because she knew you'd mostly likely do it! LOL What's a little 3rd degree when you're nice and toasty? A hot tub soak sounds nice, but getting out sounds torturous, Catherine! LOL at NP and her little fan. If she chops my finger with it, I'll have to deck her! Very cute... But I should tease you that you do live where it is rather warm? anyway, tonight I was reading a blog and they did a post on visiting Eureka Springs, AR (My Aunt June - I have had it bookmarked forever for this funky scribling quilting on a bento box quilt) Anyway, so then I had to come over to your blog to see if I remembered correctly where you lived? Small world, indeed.